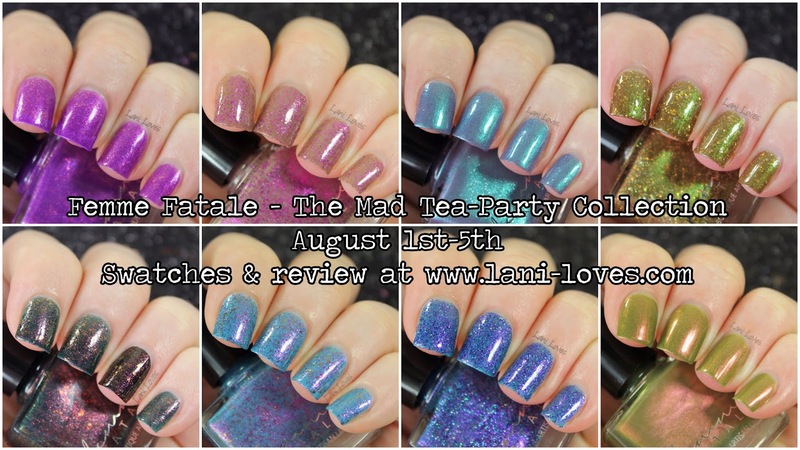 Femme Fatale's August presale collection has just gone live and I have swatches of all eight polishes in the collection to show you today! I had so much fun photographing this collection, which has a Mad Tea-Party theme. I didn't have any Alice in Wonderland type toys, so.... dinosaurs. 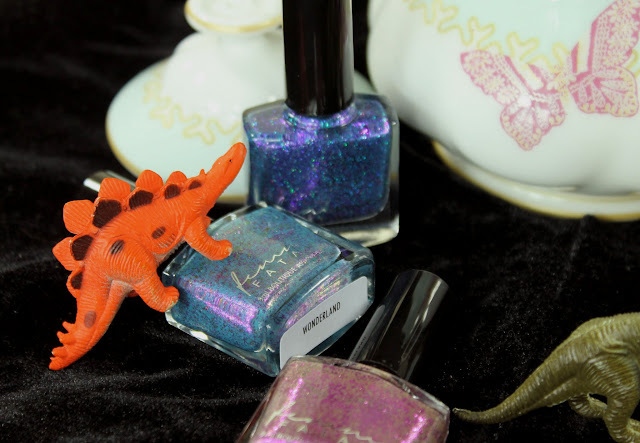 Because dinosaurs deserve tea-parties too. 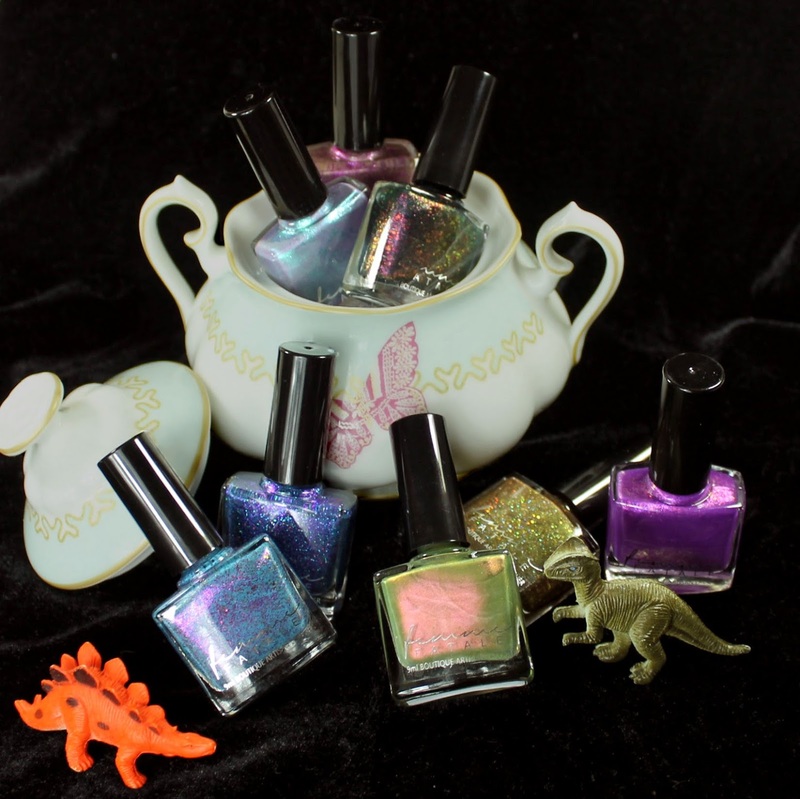 The Mad Tea-Party Collection is based upon a chapter from Alice's Adventures in Wonderland by Lewis Carroll. The contrast between muted and vibrant colours with a variety of finishes reflects the soberness and eccentricity (respectively) found within the characters in this chapter. 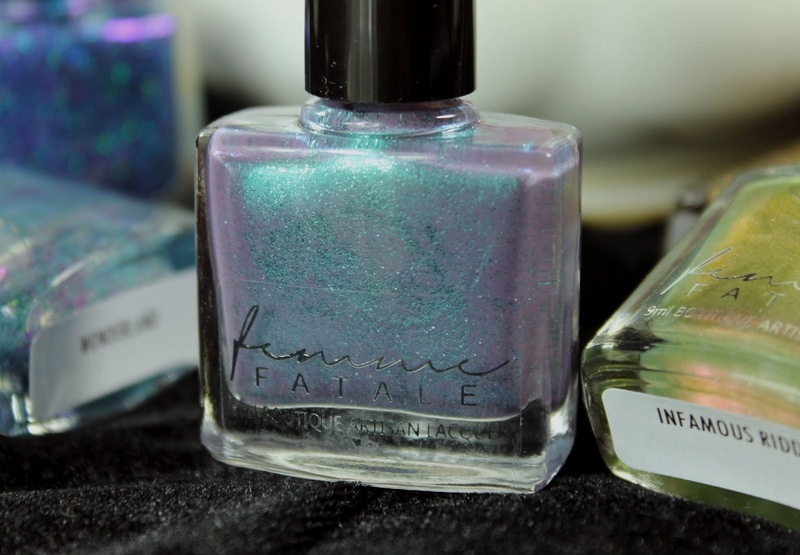 The polishes all come in Femme Fatale's standard white boxes (which you can see here) and contain 9ml. 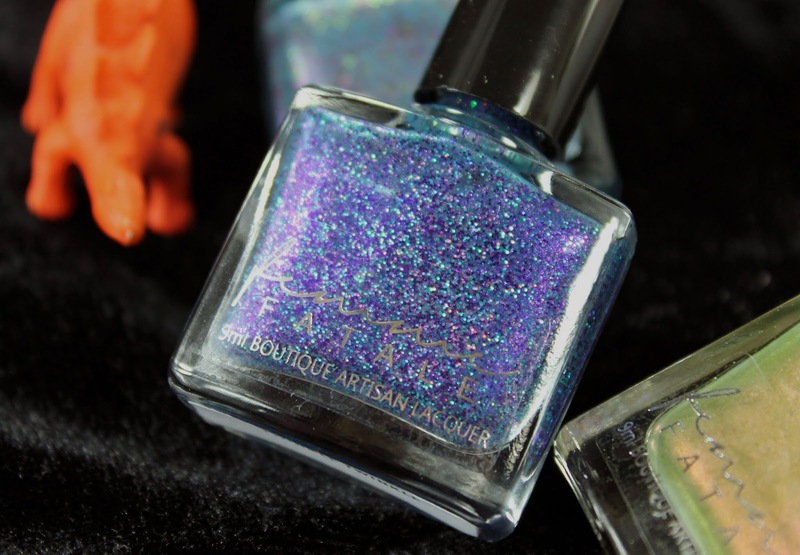 Prices start from $8.50AUD (plus GST for Australian customers) with a few of the more complex shades being priced a little higher to reflect the cost of ingredients. 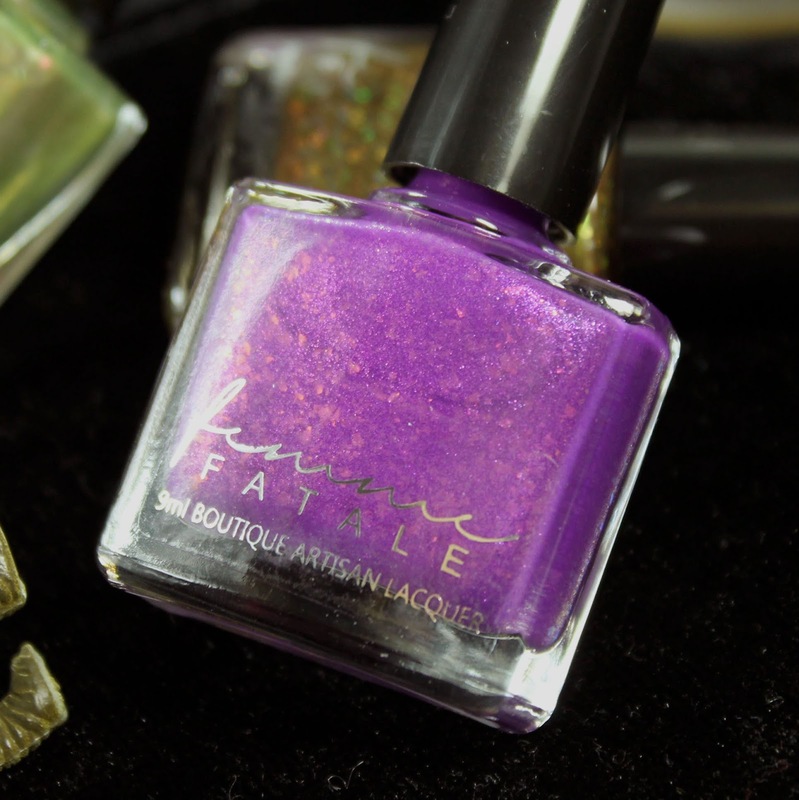 This is something I really like about Femme Fatale - rather than pricing the whole line higher to cover this cost, only the shades that actually require the price increase have the higher price (and the most expensive polish is still only $11AUD, so comparatively inexpensive when you consider the pricing of other indie brands, let alone mainstream ones!). Additionally, they're one of the few brands to reduce the price of their product alongside a reduction in the product size (they switched from 12ml to 9ml bottles at the beginning of the year). 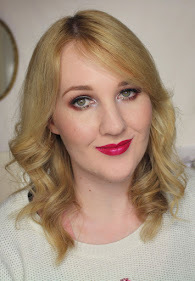 MAC, who several years ago reduced the size of their pigments from 7.5g to 4.5g but kept the price the same could certainly learn something! 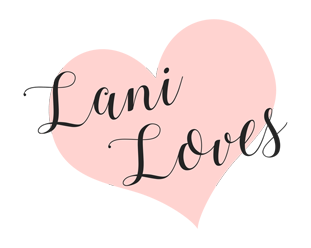 A wee note before we get into swatches! I had two bad breaks on my index and middle nails when this collection arrived two days before the presale began. Rather than punish my ring and pinky nails for the faults of their siblings, I chucked some fake nails I had leftover from my wedding over the broken nails. They are French tips, so the white is more opaque than my natural nail and with some polishes the white shows through more than it would on my natural nails. For completely accurate depiction of the polish opacity, please look at my ring and pinky nails. 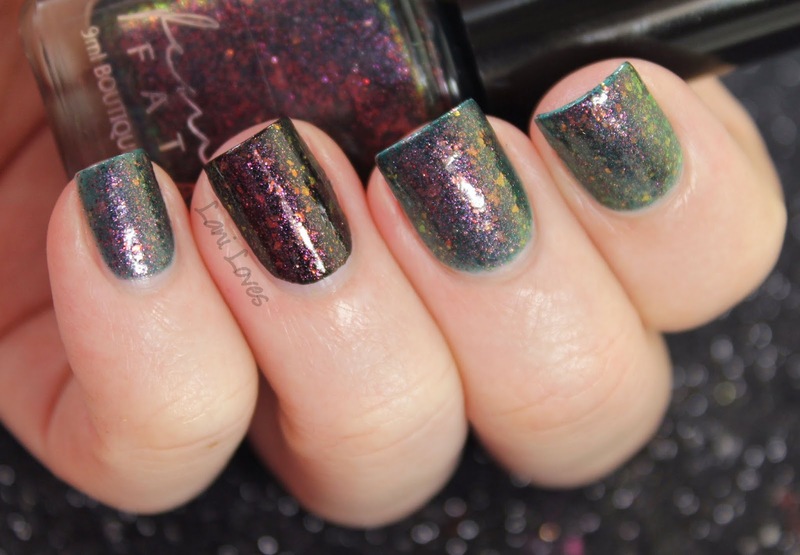 A bajillion swatches after the jump! Always Tea-Time ($8.50AUD) is a polish I didn't think I'd like at all when preview swatches went up in Femme Fatale Fiends. I'm so happy to be wrong, there is something about this glitter packed taupe crelly that works really well! I highly recommend picking this one up, even if it's well outside of your usual tastes - it just may surprise you! 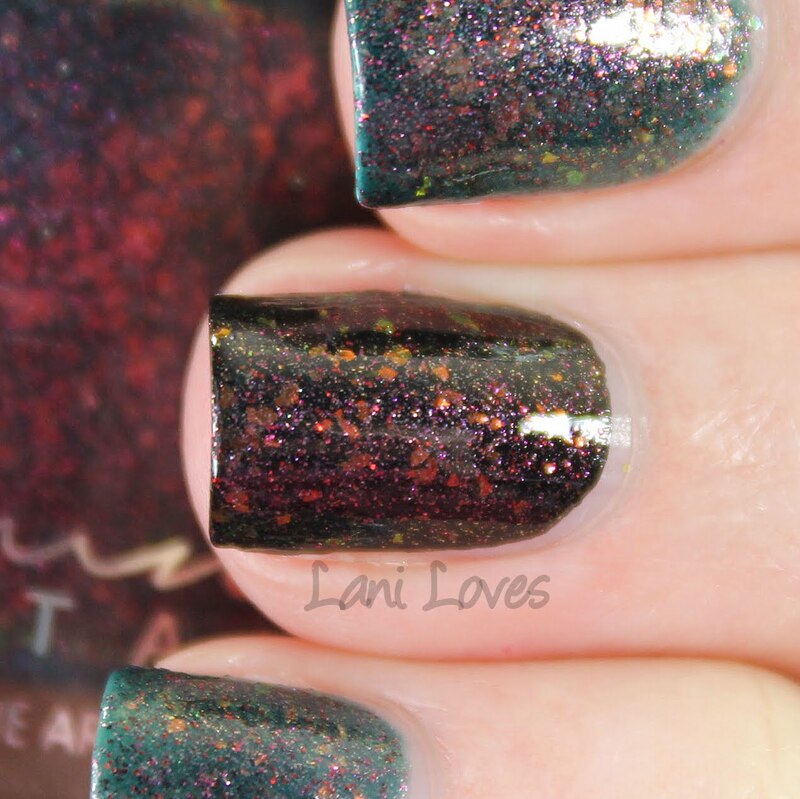 Always Tea-Time is very easy to work with, I added topcoat as it dried with a bit of texture. Infamous Riddle ($8.50AUD) is another surprise love for me! 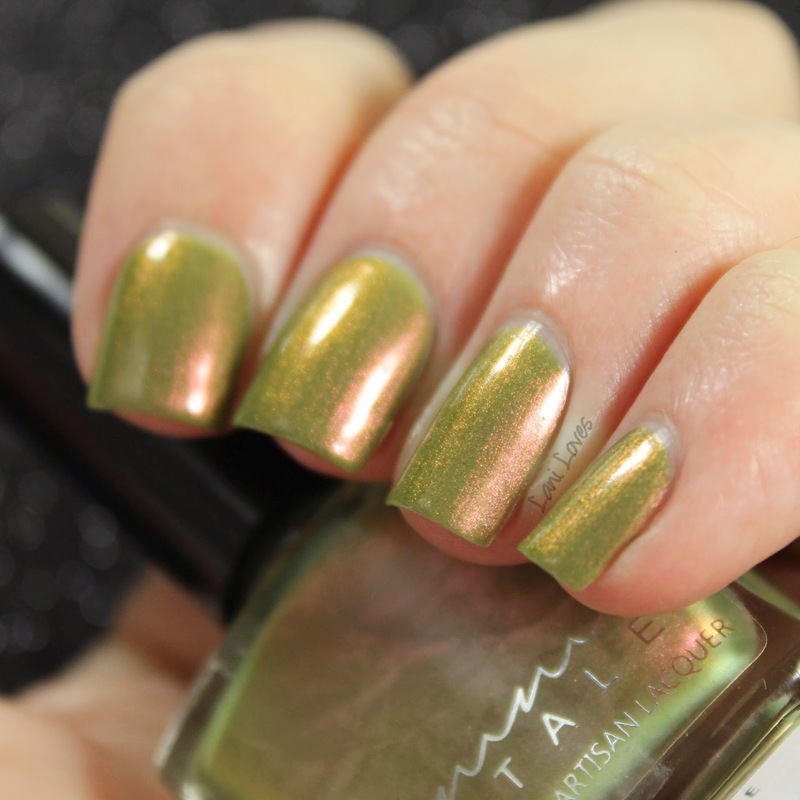 It's a luscious swampy green with strong coppery red shimmer. The duochrome aspect is constantly visible, it's not shy at all. Rather mesmerising! 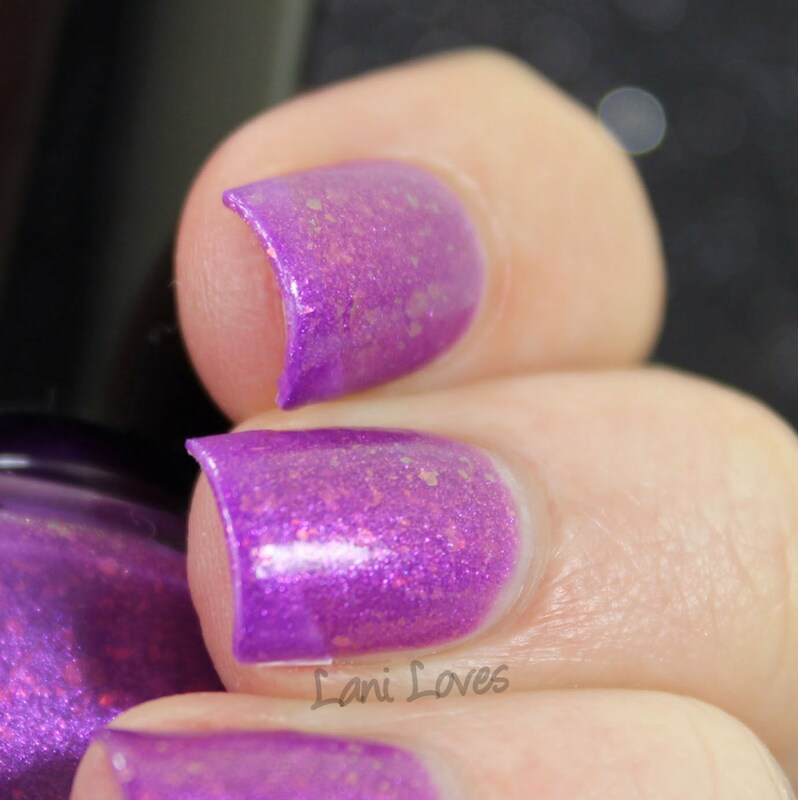 Another lovely formula here, build up perfectly in 3 coats and no top coat was needed, that lovely shine is all Infamous Riddle! 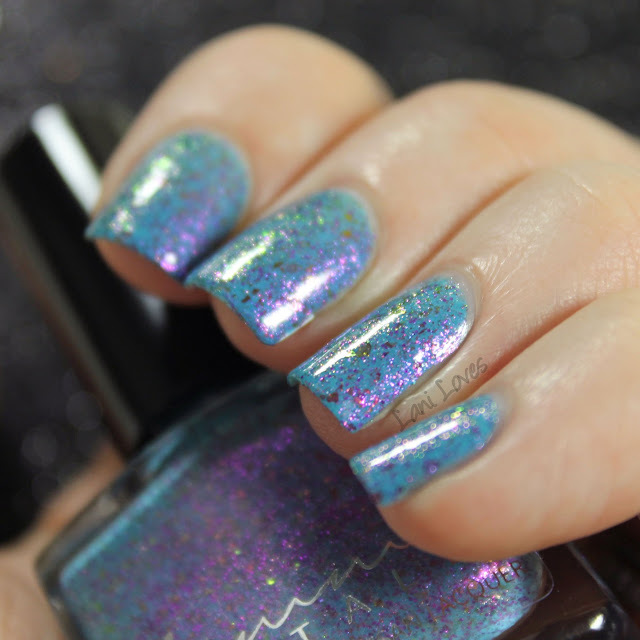 Mad As A Hatter ($10.00AUD) has a lot to live up to by sharing a name with the cult favourite and hard to find OPI polish but I'm pleased to say it more than lives up to it! 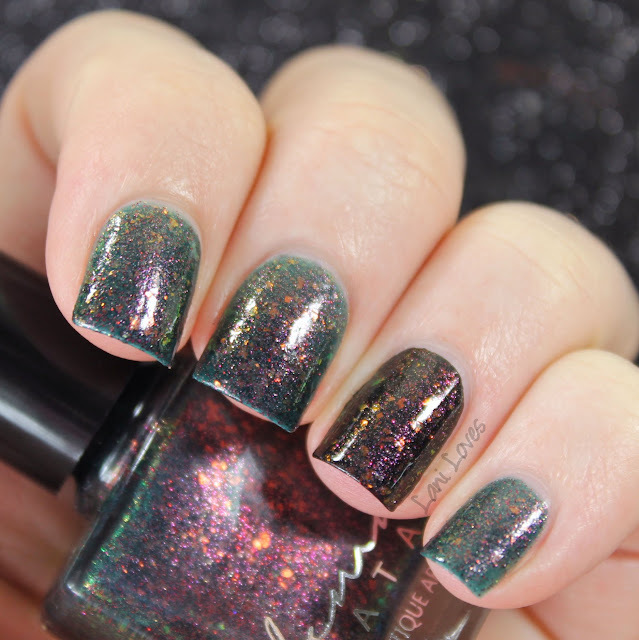 It's a dusty teal filled with classic orange to green flakies and lots of shimmer - purple and red, I think, but there's a lot going on here! Very cool and I have nothing else like it. 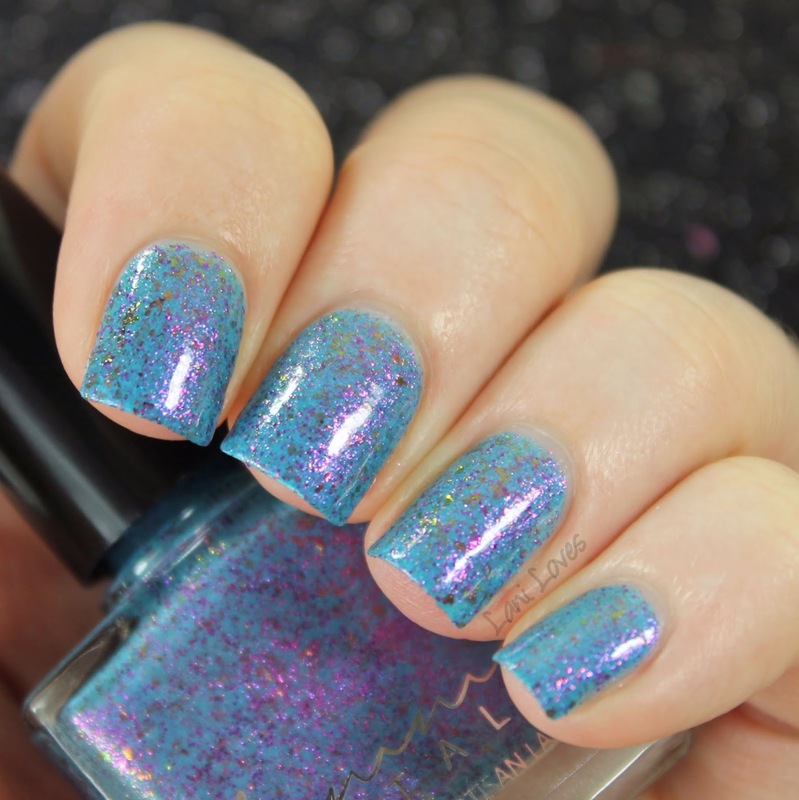 It is quite sheer, taking four coats on its own for me to be happy with opacity, so I'd layer it over matching undies next time. 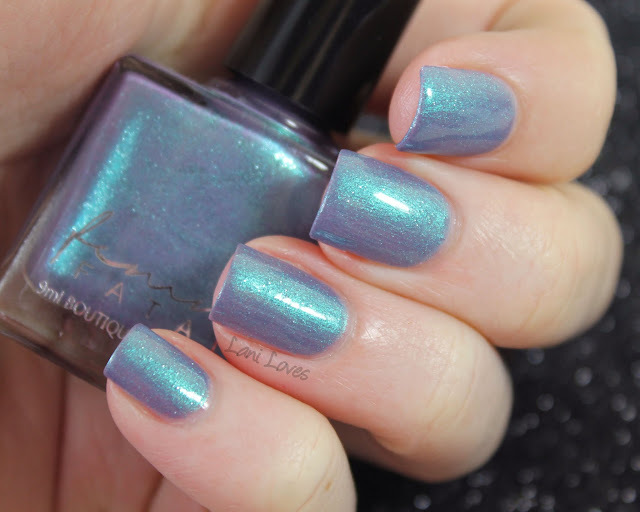 Two Days Wrong ($11.00AUD) is hands down my favourite polish in this collection! 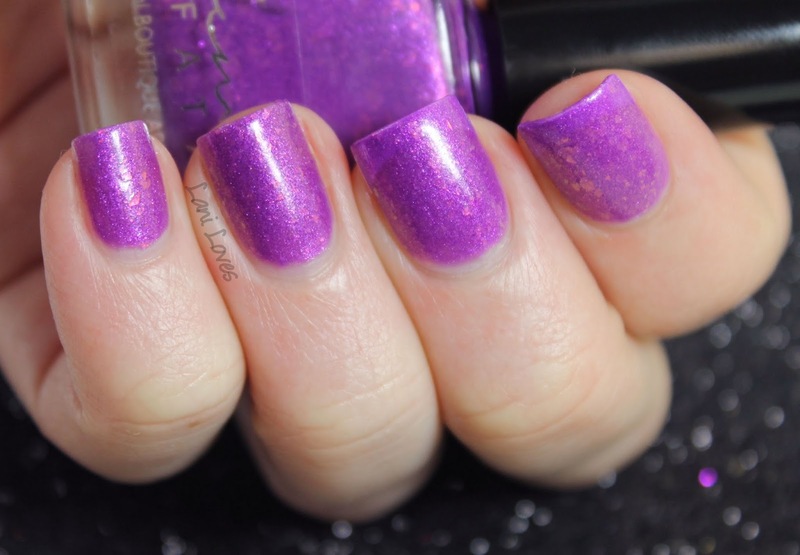 It's a thermal pink to purple thermal with shimmer and flakies. As per my note at the top of the post, my index and middle finger nails are currently French tipped falsies so the white is showing more than on my real nails. 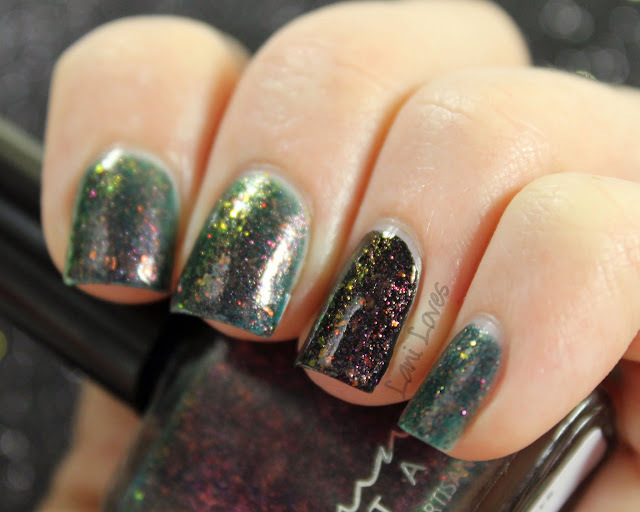 Please disregard that, opacity is accurate on my real nails (ring and pinky fingers). It was SUPER cold the night I photographed this and my hands are often quite cold as it is so I dipped my natural nails in hot water to capture the colour change. 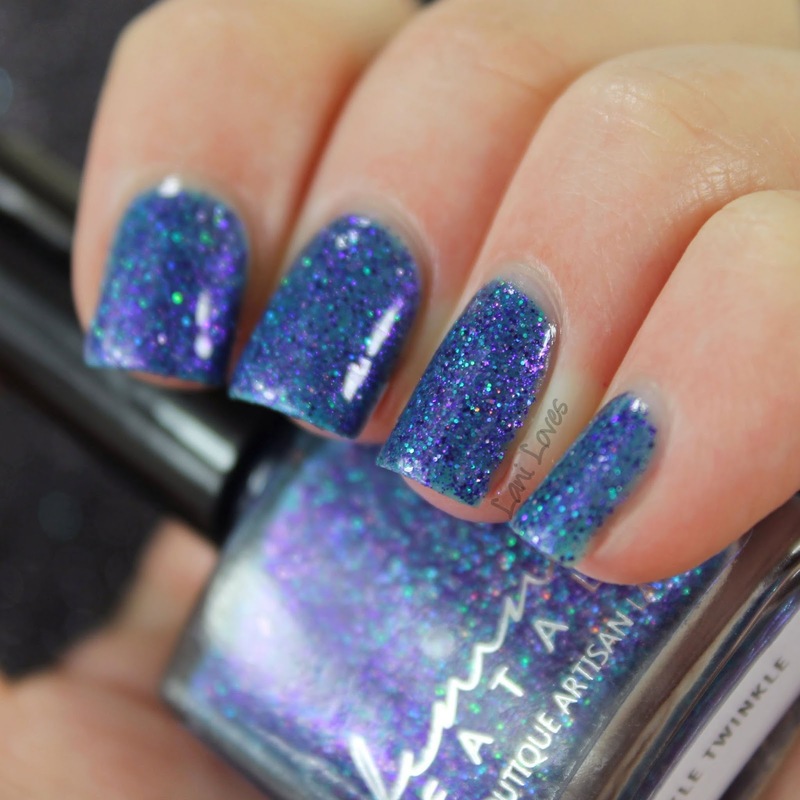 The colour change is immediate and very sensitive as you'll see when you scroll down. I highly recommend picking up Two Days Wrong! And transitioning back. Told you it was cold! 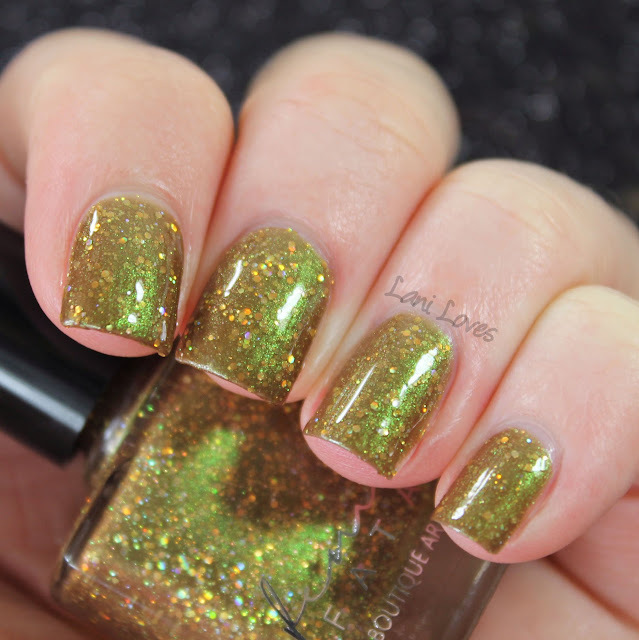 March Hare ($8.50AUD) is an intriguing shade, a warm golden brown with heavy green shimmer. It reminds me of their eyeshadow Witchwood with a healthy dose of holographic gold glitter thrown in. 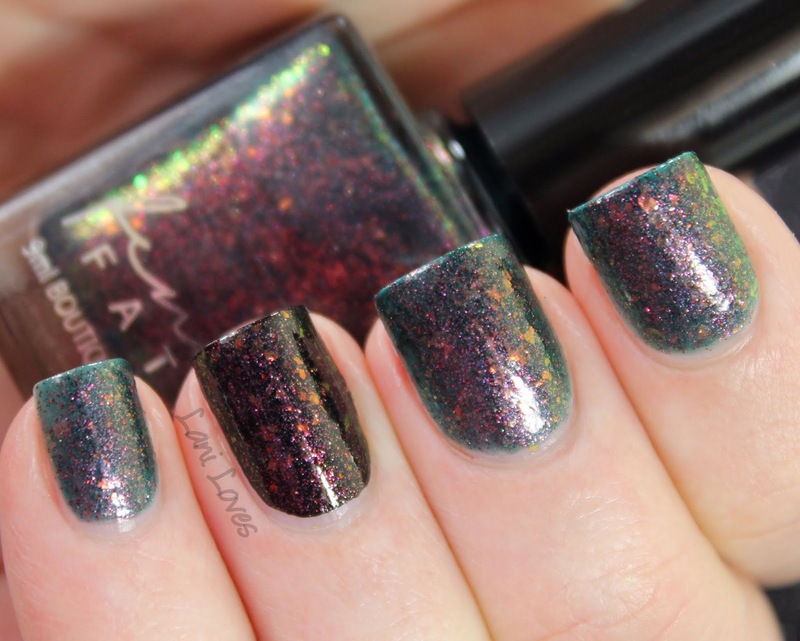 Perfectly opaque in three coats with no clumping of glitter and topcoat added for shine. Up Above the World You Fly ($8.50AUD) is my second favourite in the collection! 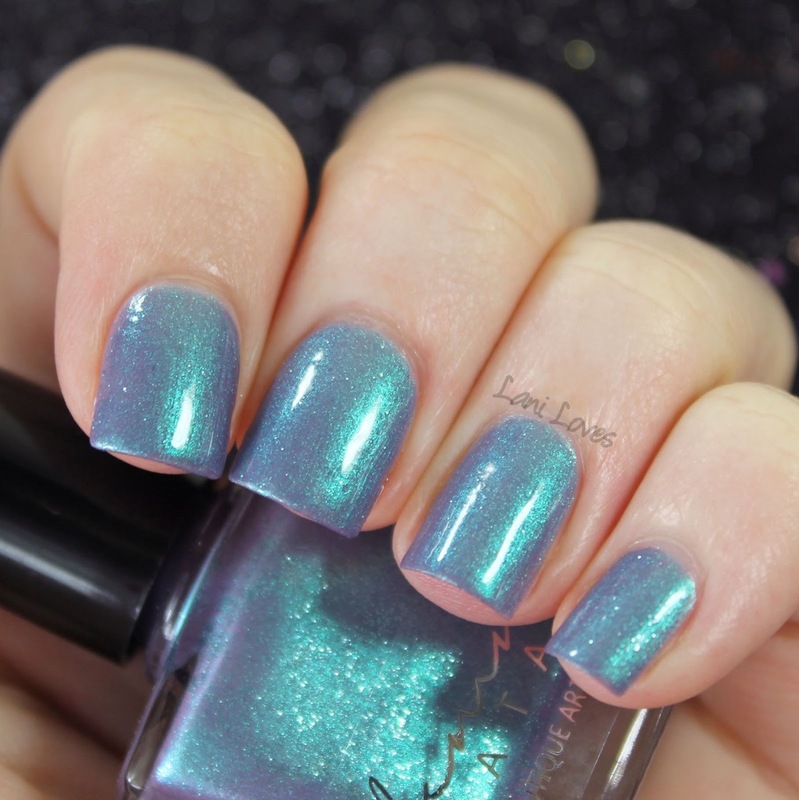 The base walks the line between periwinkle and mauve, with strong aqua shimmer and silvery blue reflects giving it a lot of depth and complexity. 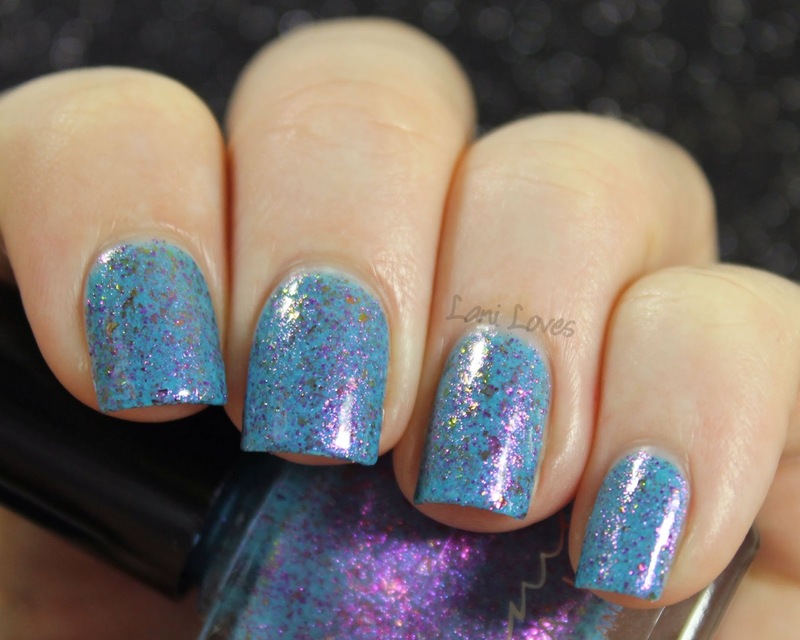 The fine glitter in the shimmery base makes it look textured when dry, but adding topcoat as I have brings the glow out. There are no duds in this collection, Up Above the World is as easy to apply as the others. Love, love, love. 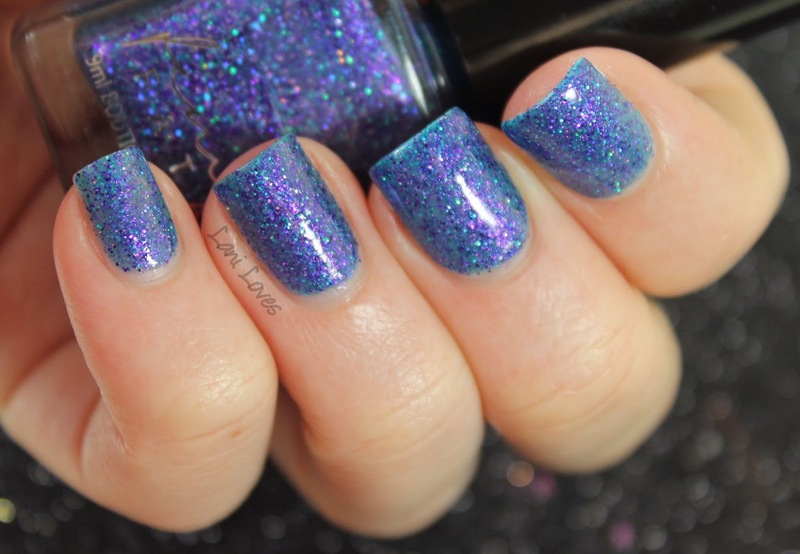 Twinkle, Twinkle ($8.50AUD) is a blue polish lover's dream. 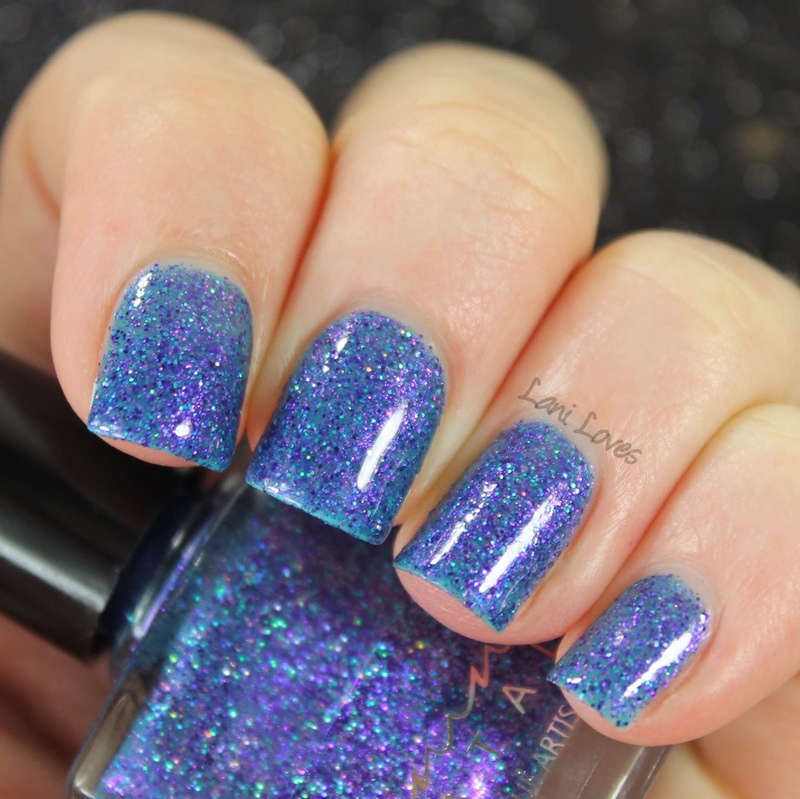 A sheer blue jelly, it's peppered with lots of microglitter and small hexes in shades of blue, periwinkle and violet. It builds up smoothly and evenly but isn't completely opaque at four coats, so my personal preference would be to layer it over undies. Are you loving this new collection? Will you be picking anything up?